Christian T-shirts are a great way to remind us that God demonstrated His love towards us in that while we were sinners (lying, stealing, etc.) God sent His son Jesus Christ to suffer and die on the cross to pay the fine that we deserved. It's also true that christian clothing bought at a christian store could be a great conversation started to share the gospel with Non-christians. "Why are you a Christian"
"Why do you wear christian clothing...?" "Do you think you're better than me, because you shop at a christian store?" We hope that some of the videos here will help you effectively share the gospel with anyone that questions you about your Christian T-shirts. Even if you aren't interested in christian clothing, we still hope that the evangelism resources here will help you. We recommend before you consider buying Christian t-shirts from us or a Christian store, that you make certain you're a Christian. "Hey, I like your shirt." That's what you'll hear a lot of when you're wearing Christian T-shirts. It's rather encouraging when you're out and about, living your daily life, and you get the encouragement of a fellow Christian for wearing christian clothing. Why not share that joy with others through giving christian clothing as a gift. Remember when you're giving or wearing Christian T-shirts that you should always be ready to give an answer to someone that asks about the hope that you have in Jesus. 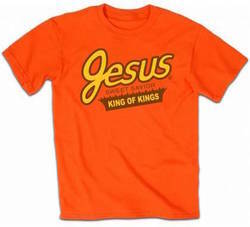 Looking for great Christian T-shirts from an online christian store? Of course, the christian clothing is not actually christian, but they are clothes (hopefully) worn by Christians. There are other places to buy Christian t-shirts and christian clothing other than a Christian store, but many of them also sell sinful shirts. It's okay, in our opinion, to sell Christian clothing on your website or retail establishment and have other products - but not sinful products. 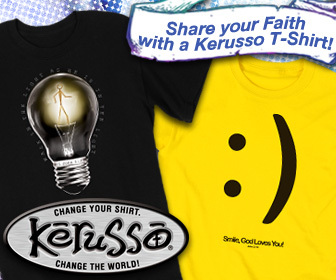 We choose to represent Kerusso christian clothing because we generally agree with their message. See a product on their their christian store that you don't agree with? We might not either. As Christians, we need to have grace for one another and also for fellow companies. Including this online Christian store.